What is the formula for translating good policy into sustainable public impact? What factors are essential to develop a framework for how public administration can increase output and results for citizens? Join us for a conversation with Larry Kamener, Senior Partner in the Melbourne office of The Boston Consulting Group and founder and former leader of BCG's global Public Sector Practice, together with Gerhard Hammerschmid, Hertie School, on how public administration can make a difference. Larry Kamener is a Senior Partner in the Melbourne office of The Boston Consulting Group. 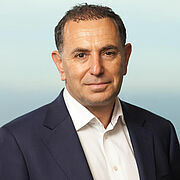 He is the founder and former leader of BCG's global Public Sector Practice. He is also the founder and current chair of BCG's Centre for Public Impact, a global BCG foundation. He is known for leading work that generates tangible impact in complex, sensitive stakeholder settings and has worked extensively across education, justice, public health, welfare and defence sectors. Prior to joining BCG he worked as an economist in the Australian and Victorian Government Treasury Departments. Gerhard Hammerschmid is Professor of Public and Financial Management at the Hertie School of Governance. His research focuses on public management reform, comparative public administration, public sector performance management and personnel management.